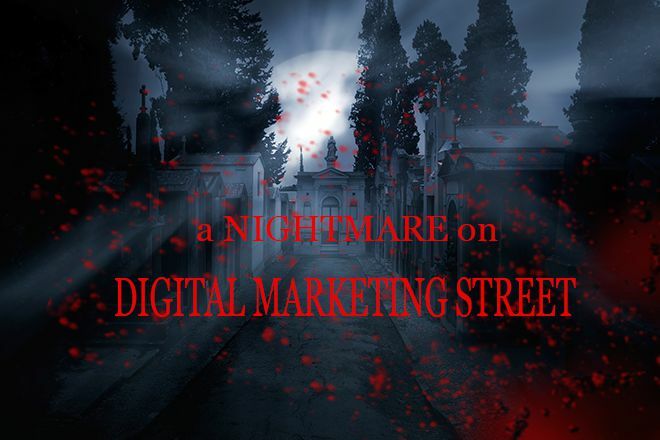 Nightmare on Digital Marketing Street | Get the Latest Online Marketing Trends in Web Design, Social Media, Blogging, and More. Horror movie buffs the world over sing praise for the classic Wes Craven film, A Nightmare on Elm Street. For the uninitiated, the leading characters of the film are haunted by a supernatural monster that kills them in their dreams, leading to their deaths in the waking world. What does this have to do with digital marketing? In this spookiest of months, it’s time to address the things that really scare you, not the least of which is probably the proverbial digital boogeyman that is keeping up with digital marketing standards. If your business fails online, chances are it will fail in the real world as well—not unlike the teenagers in the fan-favorite slasher mentioned above. So what can you do to keep up with the monsters in your company’s digital dreams? The first step is figuring out what exactly your Freddy Krueger is. Is it search engine optimization? Social media marketing? Blogging? Email marketing? Every business and every marketer has strengths and weaknesses, the key is figuring out where you’re at your most vulnerable and taking necessary steps to bolster your defense against this particular beast before it can become a real nightmare. SEO: to keep your site optimized for web searches, start by keeping an eye on the trends. Check out Search Engine Watch and other top journals to keep abreast of all the latest tips and tricks; not only will this keep you from being surprised when search algorithms change, but you can also see what you’ve been doing right and what you need to stop doing right away. Trust the professionals! Social media: the only real way to get the hang of social media is to use social media. Spend some time getting used to Twitter, Facebook, tumblr and the rest on your own before you offer those service to your clients or really dig in for your business. Remember, once it’s on social media it’s online forever, so make sure you’re starting off right. Follow industry leaders and customers alike to make sure that you’re saying what people want to hear when they want to hear it, and stay on top of current events for in-the-moment marketing opportunities. Blogging: probably the most complex facet of digital marketing, and the most misunderstood, blogging is what turns your business from a frozen victim of a changing digital landscape to active participants. This requires keyword research and at least basic understanding of what your customers want to see, but also needs to be genuine and legitimate. For the technical aspects you’ll want to talk to a professional or two, but once a week or so you can also make a post written sincerely to your ideal customer; before long, they’ll start taking notice. Other marketing techniques: things like email marketing, SMS campaigns and other digital marketing methods are cost-effective and powerful, at least according to Inc.com, but often take a little more finesse and understanding, so make sure that you’re getting guidance from an expert in the field before you jump in. You need to be armed to take these particular digital adversaries down, so don’t step into this dreamscape before you’re ready. If you want to stand up against your digital marketing nightmare and live to tell the tale, you just need a lot of determination, a little understanding, and maybe a little help from some friends. Talk to a professional today and don’t worry about your business waking up dead ever again! If you are ready to take the next steps to ramping up your digital marketing efforts, we are here to help.